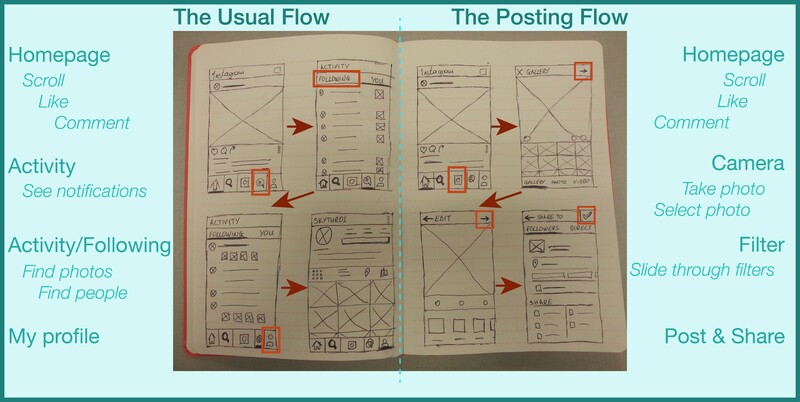 A UX and Usability Success Story: Instagram! Instagram. We are all — hopefully — familiar with this app. And I say hopefully, because it’s an amazing app. 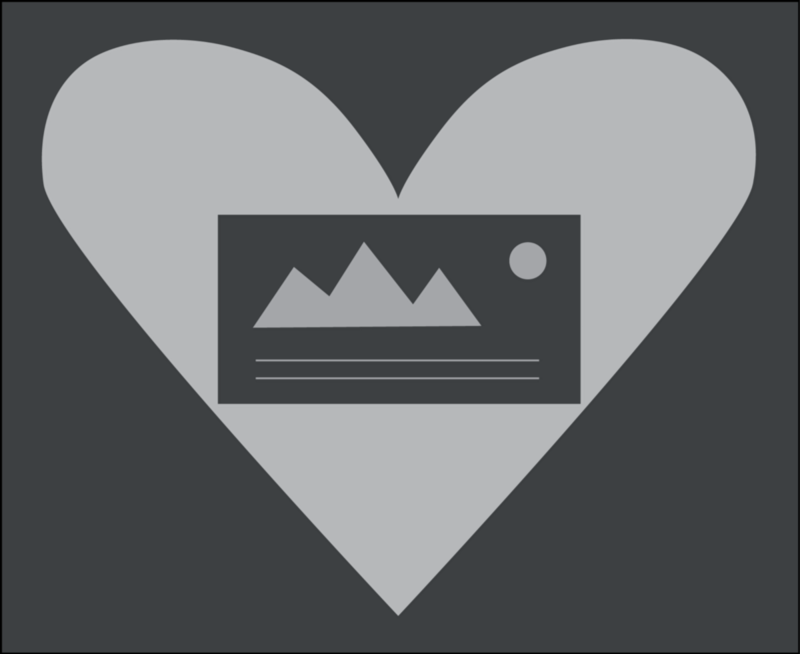 You know this feeling, when someone asks you which one is your favourite app and immediately your mind goes to the logo and some screenshots of it, while little mini hearts are floating around in your imagination? This is at least what I get whenever I am asked that question. And as we all understand so far, mine is Instagram. But what does that mean? Let’s dive in that thought for a while and examine why this is happening. First of all, I want to walk you through my habits relating to Instagram. I downloaded the app some 3 and a half years ago. At first, I thought to myself “what is all this buzz going around this app?”. I started posting a few photos of me and my friends while having coffee in coffee shops or just having fun together. As I became more familiar with the app, I started searching for images, searching for people, increasing my engagement by liking, commenting and following people. Fast forward to today, I have developed an almost ritual-like habit of opening Instagram daily and engaging with the people and the content that I love. I usually open the app right before I go to sleep every night (yes, that’s why you get notifications from me late at night, sorry!). Coinciding with my passion for urban exploration and my newly-found love for the art of photography, Instagram is the perfect place for me to find this content and engage with the people that produce this content. What is more, I can be one of those people that produce this kind of content, myself. As you can tell, I am really excited when talking about Instagram. Hence the little mini hearts floating around whenever I think about this app. This, in my opinion, happens because of a few factors. Over the years, when you really like a product or service, you develop certain habits around them. Same goes with Instagram. But in order for someone to develop habits, there must be some mechanisms in place. As Nir Eyal explains in his book “Hooked: How To Build Habit-Forming Products”, four main steps are essential for someone to become “hooked” with a product or service. Trigger, Action, Reward and Investment. I won’t go into detail explaining these steps, but I will say that I believe Instagram has successfully achieved this process, at least with me. So, here I am now, explaining how I use it daily, in an almost ritual-like manner. We have heard this a million times, over and over again, especially when it comes to social networks and their influences on people. We are social creatures and we like interacting and engaging with other people. Not only with our friends or family, but also with people that share similar interests with us, people who we consider idols or influencers and just maybe random people across the world who have something valuable to share with us. Instagram is no exception when it comes to the social aspect of social networks. It not only allows you to follow your friends and people who you know, it also lets you find people from all over the world who share the same passions with you and follow them as well, thus being able to see the world from a new perspective. It makes it that much easier for me to engage with people who like urban photography and even meet new people and create new virtual connections or even friendships. This just makes me keep coming back for more. Well, this is a no-brainer. Everyone that is on Instagram is there for the content. And more specifically, photos. Yes, people’s tastes or reasons for being there can be very different, but ultimately it all comes down to the same kind of content. Photos with minimal text or minimal description most of the times. There are people who log in to see what their friends are up to. Others go to Instagram to see photos of delicious food or desserts and get inspiration for new recipes and new kinds of food. Then, there are others who follow their favourite stars or celebrities, fitness models, YouTube stars and tattoo artists. I, for one, am there for a combination of reasons. I follow my friends to see how their daily life looks like, I follow very few important people that I consider as influencers and most importantly, I follow urban or nature photographers. A scroll down my Instagram feed, will reveal all kinds of city photography and artistic depictions of places and locations. Whatever the reason though, we are all there for the content that other people are sharing, or the content that we share ourselves for other people to enjoy. And secretly (or not), we all want to have a lot of followers eventually. There, I said it. Finally, what I believe is one of the strongest points of Instagram, is the usability and ease of use. The way it’s designed, really makes it very intuitive and simple, with no unnecessary taps or interactions to get to where you want. Both visually and usage-wise, it has a minimal and simple design. It is easy to use and puts the content at the forefront, which is why people are there in the first place. It is designed in a way that seems very natural and subtle. I am going to talk mainly about the Android version of the app, as this is what I’m using, but I believe that the experience is similar to all platforms. I have a pretty structured way of using the app. I usually open the app from the list of apps on my smartphone. Immediately, I get greeted with the latest post from the people I follow. Without any further ado, I start scrolling down the feed, liking photos as I go and maybe even commenting a few times if the photo is extraordinary, or if I want to say something funny to a friend who has posted a goofy selfie. After I’m done with checking out the latest photos, I will click on the “heart inside a speech bubble” icon, to go to my notifications section. Now, if I see that I already have some notifications when I first open the app, I will normally go to see those first and then go back to the homepage and start scrolling through my feed. So after I have checked out my notifications, I will click on the top left button, which will show me the activity of the people that I follow. This is a way for me to discover new people or just see new photos that I will potentially like or lead me to follow other people. I would like to note here that I rarely use the ‘Discover’ section of the app, which is the little magnifying glass icon next to the homepage icon. I will only use that when I am really, really bored and want to see new content, or when I want to specifically search for something or someone. But still, even though I don’t really use this feature, I find it extremely helpful, because all the photos that are displayed in there, are tailored to me based on my activity, the photos I like, the people I follow and the hashtags I use. Finally, before I exit the app for the night, I will sometimes click on the bottom right icon, which takes me to my profile page, just to check out how everything looks like and make sure that I am still awesome. Fun fact: I still am. This type of usage, does not occur very often for me, as I don’t take many photos daily. But when I do, other than being great, they are also posted on my Instagram account. Until some months ago, I didn’t have a particular or favourite way of posting them to Instagram, but lately after developing this structured ritual that I have mentioned above, I tend to open the app and click on the camera icon at the bottom navigation bar. There is also the option to select the image from my own phone’s library, without opening Instagram first, but I have found that that’s not an efficient way for me. Therefore, as I said, I will open the app, click the camera icon and select the photo that I want to post. It’s really convenient if I also want to take a picture on the go and post it right then and there. I just have to click on the “PHOTO” or “VIDEO” button at the bottom of the screen. If I already have the photo that I want to post, then I just find it from the viewfinder which shows up by default and click the arrow at the top right corner. This is the part where I spend the most time at, on this flow. The filters section. I have to make sure that my photo looks great, so I’ll go through some of the filters and decide which one fits the mood and the message of the photo best. I don’t usually tweak the settings of the filters manually, so I’ll just choose a pre-existing filter and go with that. We already have a wide selection of default filters in there, so there is no need, at least for me, to manually create other, new ones. The next and final step, is where I write the description of my photo, add some hashtags and possibly post it on my other social networks, or even add the location of the photo and tag people that are in it (or are not in it). I like how easy it is to link my other social media accounts and immediately post the photo on there as well. Even though I really like this whole flow of posting a photo on Instagram, I feel that this particular page, which is the last step when posting a picture, is a bit outdated and potentially needs a redesign. Don’t get me wrong, it doesn’t look nearly as awful as experiences in other apps, but I feel like this specific page looks and feels different than the rest of the pages in this flow. It gives me the feeling of being in a boring Settings page or a Legal section of the app. But it definitely doesn’t look like an important step just before you post a photo on Instagram. First of all, I want to be able to clearly see the photo I am posting, while I write the description for it. Currently, the photo is situated just in a small thumbnail-sized box at the top left, which makes it very hard to grasp the meaning or the details of it. When I write a description, I usually draw inspiration from the photo itself. So, by seeing it in a large display, it would make it more likely that I figure out a nice quote to say about the photo. There’s also a lot of white space in this screen, in my opinion. White space is not necessarily good or bad. Depending on the situation, we can use it for effect or emphasis. But in this case, it doesn’t serve anyone and it just looks a bit dated. This is why I would like to resize the photo to be posted, almost to the size it takes in the previous screens of this flow, and place the rest of the features and functionality below that. This way, it would feel like a natural transition from the previous screen to this one, and it would make it easier for people to actually see their final image before they write their description and then post it. So I was able to re-design this particular page, and incorporate the aspects I have mentioned above. What has changed, is the size of the photo and the placement of the rest of the features that this page offers. As you can see in the new, re-designed screen below, the description box has now moved below the now full-sized image, with the option to add a location and share the image to your other social media accounts at the bottom. When it comes to usability, all these features are closer to the bottom, thus closer to the thumbs of the users while holding their phone, which makes it easier for them to click on these features without much effort or extension of their fingers. Additionally, I have incorporated the “Tag People” feature inside the actual image, so that way users can click wherever in the image to tag their friends or anyone else in that photo. 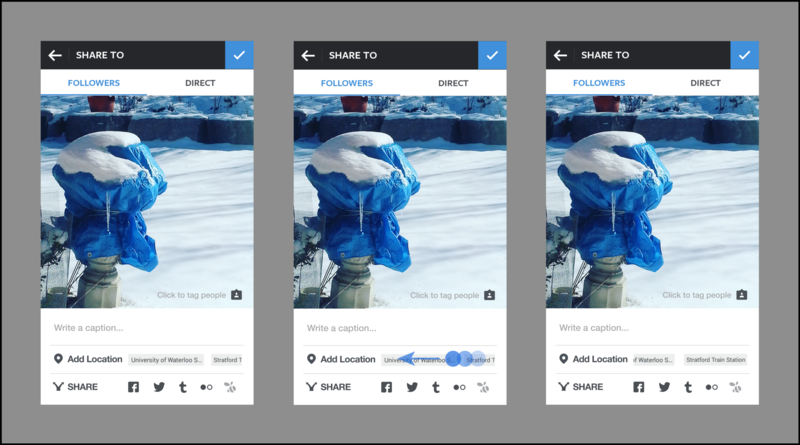 When it comes to the “Add Location” and “Share” features, I kept the nice sliding function of the suggestions of location and I expanded it to the sharing feature as well. 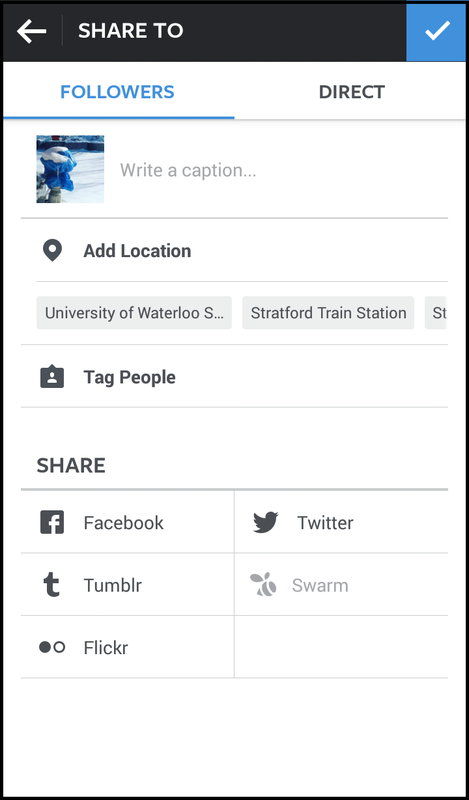 So now you can slide to see more locations and also more social networks as they are being added. This functionality of sliding left or right, is subtly being signified by the fact that the second box is cut off, which shows that there are more options to be found next to that. Finally, I have identified one more thing that needs to be highlighted. Not many people are aware of this, but there is actually a way to see the photos that you liked over the course of your existence in Instagram. Yes! Shocking, I know. Currently, you can find this feature by going to your profile tab, clicking on the “three dots” menu icon at the top right corner and scrolling down to the “Account” section which lists the option “Posts You’ve Liked”. As we can see from this user flow I have just described, the feature is somewhat hidden in the Account section of the Options page. I believe this is an important feature for people who use Instagram, so I would suggest that this functionality be moved somewhere else that would make it more visible and accessible to users. My recommendation, is that this feature be moved to the “Discover” section of the app, either by adding an icon in that page, or by adding a menu, to list everything under. As we discussed in class as well, a menu is not always the right solution. Menus can be very helpful when you have many and different sections to list, but when it comes to just a feature, then the best option to go with, is to create an intuitive icon that denotes the meaning of that feature and requires just a tab in order to get to that page. I used the colours of Instagram and I followed the same style of their existing icons. The heart, indicates that it’s something that you like or love and it also came to mean that it takes you to your “Favourites” section. The difference between the two icons, is what is included inside of the heart. The one at the left, includes an icon of a photo, which can imply that this is the section with your favourite photos. 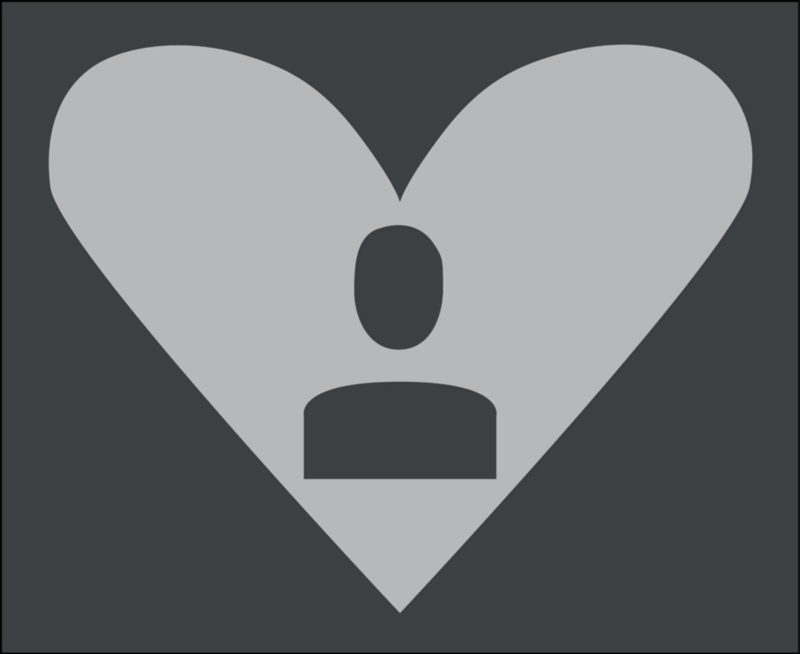 The icon on the right has the outline of a person inside the heart, following the same style with the Profile Page’s icon, thus implying that it takes you to YOUR favourite section. Of course, these are just suggestions. Both the re-design of the posting page and the two possible icons, are just a recommendation for my own personal style and thinking. If I wanted to actually implement these changes, I would have to go out and do a usability testing, after having done a thorough UX research on the matter. Instagram gets a lot of love. That’s undeniable. Its simplicity and great user experience, combined with the content that it offers, makes users keep coming back for more. Not only does it provide a great experience, but it also evolves constantly. It seems that every few weeks or so, there is an update where we get introduced to something new, either that’s a major feature or just a tiny subtle detail. An example of that, is the recent addition of the “Add account” feature. This is a feature that was being requested by lots of people for a long time now. It goes to prove that the Instagram team listens to its users and tries to provide the best options for them. Now, people with multiple accounts, personal or business ones, can get rid of an extra hassle of having to log out and back in again every time they wanted to switch accounts on Instagram. Yay for the great UX Research and Usability Testing team of Instagram! And to stay true to my cover illustration, I will close with this sentiment: Instagram, I love you! This case study / reflection and its media contents have been created with tools like Adobe Illustrator, Adobe Photoshop and good old sketching. I firstly sketched out the outlines of what I had in mind. After that, I transferred my sketches into digital form with the help of Photoshop and Illustrator. Finally, I created the text and inserted all the media in this article. Yay for technical skills!